I LoVE the shape of this in our mid century modern living room. It is absolutely perfect (and I really love that there was a matching console table). It came with a defective leg but Overstock replaced it immediately and at no charge. The charming, classic mid-century modern design of this Kristiansand table from Carson Carrington fits well with other mid-century modern, industrial, or vintage furniture. Its simple design will help you to create an unpretentious sense of sophistication with your home decor. Enhance the table's appeal by pairing it with a stack of your favorite vintage novels, a terracotta pot of succulents, or a collection of decorative stones. Overall - very nice item - as described and fair for 20% off coupon price paid. Shipped in durable box lined with rigid Styrofoam lining and a second interior cardboard liner. All parts wrapped, held tight and isolated from each other. There was no damage of any sort from transit. This product was one of the most durably and correctly packed unassembled furniture products we have ever received. 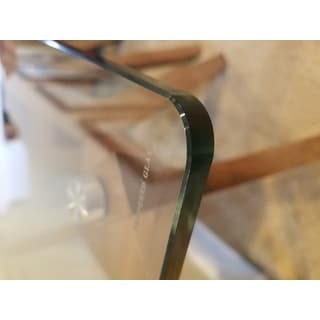 Glass top is flat, thick and heavy, very well made of clear tempered glass (unfortunately its engraved "TEMPERED" in 6 pt font on the surface) with a grey-green tint on edges which have a flat edge with 1/16" bevels to top and bottom surface, corners are rounded - the edges are perfectly smooth and glossy, and the top had no scratches or marks. The wood legs are rectangular profile solid finger jointed lumber which due to the wood grain, texture, stain color and build are very well concealed. The shape is a non-symmetrical boomerang. There are black rubber anti-slip cushioning pads that screw into each leg bottom which could be used to level the table. The flat wood top appears to be a single solid piece or a veneer over a solid piece. The stain is uniformly-applied and the clear cost is thin and satin in finish (one of the pieces has a blemish in the clear coat that left a rough finish but it’s not very noticeable). The assembly was easy - the legs screw into the table top then the wood tray attaches which means the glass top is locked into place so you don’t have to worry about it moving or sliding. 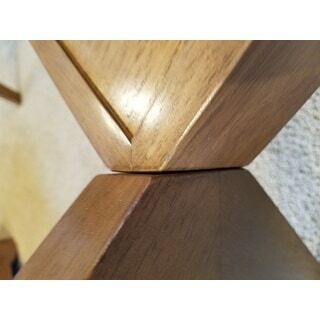 The joint where the wood tray attaches to the legs is not a very crisp connection and has lots of room for float and minor gaps at the sides and the alignment must be eyeballed - but again its not readily noticeable unless you look for it. The assembled product is sturdy, but you can wrack / twist the top slightly up to an 3/16" which places the legs into and out of alignment due to the fact that the legs attach with a single screw, verses two, so the legs can pivot slightly at their connection point - all of this could have been rectified by a better detail where the tray connects to the legs. The stain color is what I would call a true walnut (very similar to Minwax Early American 230 (think Raw Umber) with the dark graining and specs more Special Walnut 224 (Burnt Umber) - the stain appears to have several penetrating coats so the color is rich and not too transparent, it has a satin finish. It is a handsome table that is substantial in size but due to the glass top not giant feeling - the design bridges Mid-Century Mod to contemporary. Overall impression is that it looks as good or better than the Overstock image - it looks like a quality (not cheap but definitely not heirloom) piece. HIGHLY RECOMMENDED. 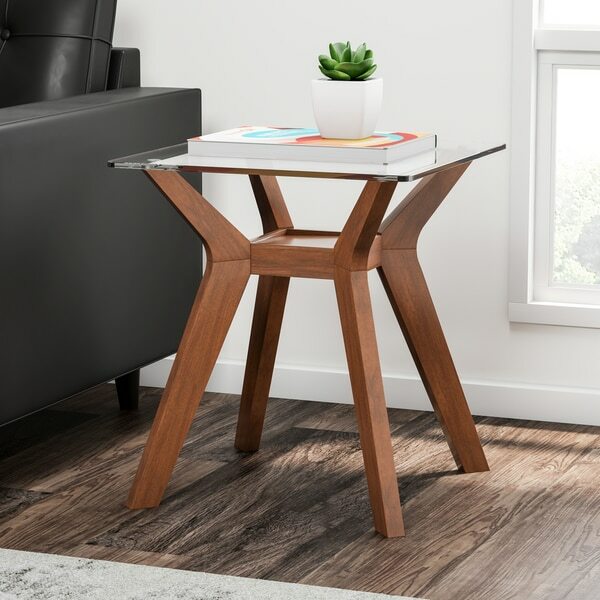 This mid century modern end table was easy to assemble and looks great. 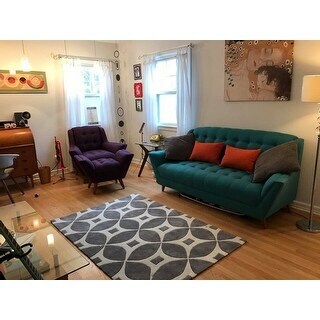 It goes great with the coffee table and the mid century mink sofas and chairs we bought. Sturdy and looks good too. I bought this ofor a guest room and it was a bit large for a bedside table. I amusing it with the Portofino Deane Linen Chair (also from Overstock) and it creates a wonderful relaxing space for guests. I didn't check the directions before starting to assemble and quickly realized that the legs attach to the glass THEN the center block is added. It was easy to assemble (once I read the directions) Only took about 10 minutes. Be sure to use the silicon washers between the legs and top to protect the glass when you tighten them down. Beautiful table. Medium colored wood, substantial glass top, touch of silver, with a great shelf for displaying precious objects. These are perfect for our high sofa so two together make a great coffee table. Easy to assemble. Exactly what I was looking for. Fits in nicely with my other mid-century furniture. This item is sturdy and classy with thick glass for the top of the end table. Thinking of purchasing another one. This nightstand looks and feels like a very high quality piece of furniture. I would definitely recommend this to anyone looking for a side table or occasional table as well. I may purchase another one! I bought two of these end tables for my newly redecorated mid-century, industrial, glam living room and they're gorgeous! Love, love, love them. I bought two end tables and a coffee table. They are easy to assemble, very solid and attractive. I have received many compliments from friends on the design. Sturdy, heavy duty, will not tip. Attractive. Gaps between the square of wood and the legs are the only drawback but I think that's just the way it has to be when you assemble a product and it's not visible from all angles. This is a great end table and was so affordable. I originally bought this for my living room, but end up putting it into my family room as it matched well. Nice table. I just ordered a second one. Lovely table. Bought for my shore home. Highly recommend. Very nice, glad I bought matching coffee table. This end table works perfectly for our needs. You do not need to worry about condensation moisture or spills on the glass top and the wood shelf and legs give it warmth. We always need a shelf for books or magazines. Great table! "In the description it says it's walnut, but in the picture it looks lighter. What color is it? Mary"
"How is the glass attached? Or is it just set on? I have a 10 month old that is pulling up on Everything. " I have purchased two of these tables. The top is made of thick heavy tempered glass and is securely attached to the base. 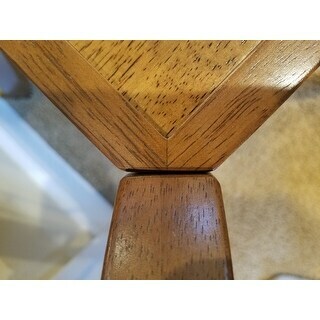 Very nice quality table. Glass is screwed on somehow. very sturdy and heavy. I have an Adrian Parsell coffee Table and it matches it fairly well.